Please help New Evangelizers keep providing free tools and resources to those in need. Please click the red donate banner above to make a direct donation to our ministry today. 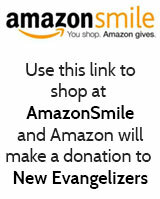 You can also shop on Amazon and they will send a portion of their proceeds to help support New Evangelizers on your behalf. Be sure to click here before you shop. Thank you! New Evangelizers, founded by Greg and Jennifer Willits, is all about providing free online resources as well as free CD’s, DVD’s and rosaries to help Catholics know their faith, live their faith, and share their faith more effectively. We accomplish this by producing and distributing online catechetical materials that promote individual spiritual growth and study. Our materials are like a spiritual starter kit to help people start living a more fulfilling life in Christ. Rosary Army Corp., a 501(c)3 non-profit religious organization founded in 2003, is loyal to the magisterium of the Roman Catholic Church and wishes to serve all visitors curious about the Rosary and the peace that it brings to one’s life. Rosary Army began with a simple mission: to make, pray, and give away all-twine knotted Rosaries and to encourage others to do the same. Since then, thousands of these signature all-twine knotted Rosaries have been spread around the world due to the resources available on this website. 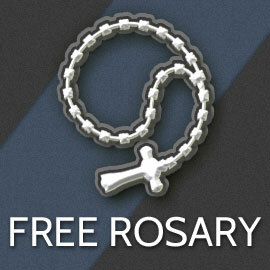 Having and praying rosaries are just one of the spiritual tools we use to help us find peace in our circumstances. This ongoing need to increase personal peace amidst suffering is why Rosary Army had to form. It seeks to combat this suffering by educating the public on how to: make these non-beaded rosaries themselves; recite the prayer correctly and increase personal contentment by giving away the hand-made rosary to someone in need. As long as the donations keep coming in, Rosary Army pledges to continue providing rosaries to households in the United States* from our limited inventory. *International orders can only be processed with an online donation made in advance to cover the high cost of shipping and handling outside of the United States. Please contact [email protected] for details. Excellent for RCIA, youth groups, or anyone simply interested in Catholicism. The National Catholic Register calls it “Humorous…yet reverent.” We think that’s a perfect description. You can get all nine episodes for free on DVD, and order boxes of them to give away to everyone who might have questions about the things Catholics do. Total Consecration to Jesus is an absolutely beautiful exercise to increase your spirituality and ability to truly serve our Lord Jesus Christ. The basic premise set forth by St. Louis Marie de Montfort is simply that Jesus came into the world through Mary and that for us to always be assured of being close to Jesus, even closer than ever before, we should go through Mary. Consecration means to set aside for a sacred purpose. Mary’s life was set aside for the sole purpose of serving our Lord. By following her example, we, too, can completely give ourselves to Christ in a fundamental way that consecrates us to Him. We give our lives to Him in service and love. Our website has full text and audio files for each day of prayers, along with schedules and additional information to help you on this most beautiful of spiritual exercises.